The Old Lahaina Luau is the only venue with its own private seaside village. Reminiscent of days gone by, the ambiance is felt immediately. Thatched roofed buildings, tiki torches, warm tradewinds and warmer smiles begin your evening of pure Aloha. After being escorted to your reserved seats, enjoy a tropical beverage as you stroll around the beautiful oceanfront grounds. Hawaiian arts & crafts are on display along with hula lessons and island games for those that want to take part. Then, gather around for the Imu celebration as the Kalua pig is removed from its underground oven. At sunset, the central entertainment of the only traditional and genuine Hawaiian luau begins. 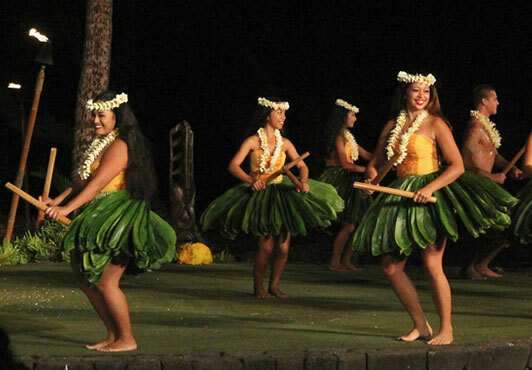 Through legendary song, music and dance, this unique and awe-inspiring best Maui luau tells the story of its people from past to present. Enjoy the timeless journey, as dancers tell their stories with graceful moves, subtle eyes and lovely hula hands.